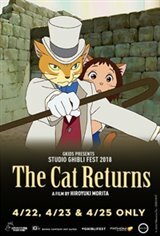 Fathom Events and GKIDS are excited to bring The Cat Returns to movie theatres nationwide for a special three-day event on April 22, 23 & 25 as part of Studio Ghibli Fest 2018. From the legendary Studio Ghibli, creators of My Neighbor Totoro and the Academy Award®-winning Spirited Away, comes the charming and magical adventure that will delight the entire family. After Haru jumps in front of traffic to save a cat from an oncoming truck, she is shocked to see the cat get up on its hind legs, brush itself off, and thank her politely. But things take an even stranger turn when later than night, the King of Cats shows up at her doorstep in a feline motorcade!